Long before the Earth and sun existed, a Jupiter-sized planet formed around a sun-like star. Now, 13 billion years later, NASA's Hubble Space Telescope has precisely measured the mass of this farthest and oldest known planet, and an international team of scientists has determined the age and mass of a companion helium white dwarf. Brad Hansen, assistant professor of physics and astronomy at UCLA, and his colleagues report in the July 11 issue of the journal Science that the white dwarf is only 480 million years old. (Most white dwarfs around neutron stars are several billion years old.) The white dwarf is approximately one-third the mass of our sun, or approximately .35 solar masses, Hansen said. The ancient planet orbits a peculiar pair of burned-out stars, the white dwarf and a pulsar, in the crowded core of a globular star cluster. The full team conducting the research with Hansen is Harvey Richer, University of British Columbia; Steinn Sigurdsson, Pennsylvania State; Ingrid Stairs, University of British Columbia; and Stephen Thorsett, University of California, Santa Cruz. The new findings close a decade of speculation about the true nature of this ancient world, which takes a century to complete each orbit. The planet's mass is 2.5 times that of Jupiter. 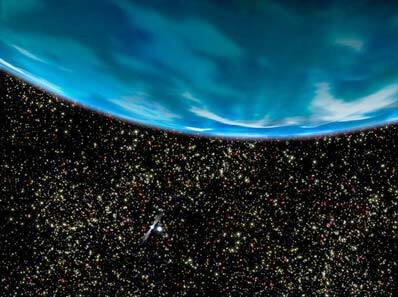 Its very existence provides tantalizing evidence that the first planets were formed rapidly, within a billion years of the Big Bang, leading astronomers to conclude that planets may be very abundant in the universe, the astronomers said. The giant planet lies in the core of the ancient globular star cluster M4, located 7,200 light-years away in the summer constellation Scorpius. Globular clusters are deficient in heavier elements because they formed so early in the universe that heavier elements had not been cooked-up in abundance in the nuclear furnaces of stars. Some astronomers had argued that globular clusters cannot contain planets � a conclusion supported in 1999 when Hubble failed to find close-orbiting "hot Jupiter"-type planets around the stars of the globular cluster 47 Tucanae. Now, it seems that astronomers were just looking in the wrong place, and that gas-giant worlds orbiting at greater distances from their stars could be common in globular clusters. "Our Hubble measurement offers tantalizing evidence that planet formation processes are quite robust and efficient at making use of a small amount of heavier elements," Sigurdsson said. "This implies that planet formation happened very early in the universe." "This is tremendously encouraging that planets are probably abundant in globular star clusters," Richer said. He bases this conclusion on the fact that a planet was uncovered in such an unlikely place, orbiting two captured stars � a helium white dwarf and a rapidly spinning neutron star � near the crowded core of a globular cluster, where fragile planetary systems tend to be ripped apart due to gravitational interactions with neighboring stars. The story of this planet's discovery began in 1988, when the pulsar, called PSR B1620-26, was discovered in M4. It is a neutron star spinning just under 100 times per second and emitting regular radio pulses like a lighthouse beam. The white dwarf was quickly found through its effect on the clock-like pulsar, as the two stars orbited each other twice per year.� Astronomers later noticed further irregularities in the pulsar that implied a third object was orbiting the others. This new object was suspected to be a planet, but it could have been a brown dwarf or a low-mass star. Debate over its true identity continued through the 1990s. The astronomers settled the debate by at last measuring the planet's mass through celestial detective work. They had Hubble data from the mid-1990s, taken to study white dwarfs in M4. Sifting through these observations, they were able to detect the white dwarf orbiting the pulsar and to measure its color and temperature. Using evolutionary models computed by Hansen enabled an estimate of the white dwarf's mass and age to be made. This information was compared to the amount of wobble in the pulsar signal, allowing the astronomers to calculate the tilt of the white dwarf's orbit as seen from Earth. When combined with the radio studies of the wobbling pulsar, this critical piece of evidence told them the tilt of the planet's orbit too, and thus the precise mass could be calculated. With a mass of only 2.5 Jupiters, the object is too small to be a star or brown dwarf, and must instead be a planet, the astronomers said. The planet has had a rough road over the last 13 billion years.� When it was born, it probably orbited its youthful yellow sun at approximately the same distance Jupiter is from our sun. The planet survived blistering ultraviolet radiation, supernova radiation and shockwaves, which must have ravaged the young globular cluster in a furious firestorm of star birth in its early days. Around the time multi-celled life appeared on Earth, the planet and star were plunging into the core of M4. In this densely crowded region, the planet and its sun passed close to an ancient pulsar, formed in a supernova when the cluster was young, that had its own stellar companion. In a slow-motion gravitational dance, the sun and planet were captured by the pulsar, whose original companion was ejected into space and lost. The pulsar, sun and planet were themselves flung by gravitational recoil into the less-dense outer regions of the cluster. Eventually, as the star aged, it ballooned to a red giant and spilled matter onto the pulsar. The momentum carried with this matter caused the neutron star to "spin-up" and re-awaken as a millisecond pulsar. The planet continued on its leisurely orbit at a distance of about two billion miles from the pair � approximately the same distance Uranus is from our Sun. It is likely that the planet is a gas giant, without a solid surface like the Earth. Because it was formed so early in the life of the universe, it probably does not have abundant quantities of elements such as carbon and oxygen. For these reasons, it is very improbable the planet would host life, the astronomers said. Even if life arose on, for example, a solid moon orbiting the planet, it is unlikely to have survived the intense x-ray blast that would have accompanied the spin-up of the pulsar. Hansen's research is funded by the Space Telescope Science Institute, which is operated by the Association of Universities for Research in Astronomy Inc. for NASA, under contract with the Goddard Space Flight Center, Greenbelt, Md. The Hubble Space Telescope is a project of international cooperation between NASA and the European Space Agency.